Cleveland has proven himself to be an exceptional sire having 8 finished champion daughters, 5 of which have earned their Superior Genetics designation. He handily earned his superior genetics designation along with being named an Elite Sire in both 2015 and 2016. 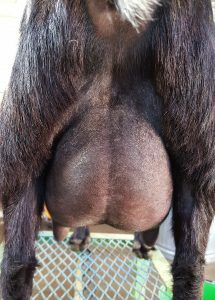 He won 2nd Place Get of Sire at the 2015 ADGA National Show. Choosing him to breed Kahlua to was a no-brainer. 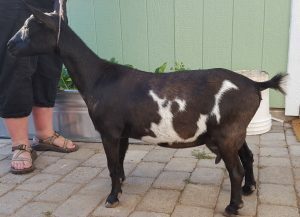 Unfortunately getting a doeling from this breeding was not to be and Kahlua gave me 2 bucklings. Before we were positive he was staying we started calling him Chalupa since we were calling his brother Batman (those that watch the League will get the reference). He knows his barn name so it stuck. Chalupa stood out to me the minute he stood up. He was incredibly long and level with a very high escutcheon and immense width between his hocks. He showed a very nice brisket extension, good space between the ribs and a really nice long, wide, flat rump. 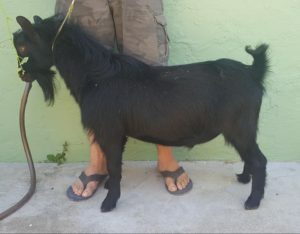 It didn’t take me long to decide that he would be the very first buckling we were going to be leaving intact in the 7 years we’ve been breeding goats. I’m hoping he passes on some of his sire’s traits to his daughters. Chalupa’s first kids hit the ground in 2018 and they were everything I hoped they would be. I retained both of his daughters, Dog Island Buttermilk and Dog Island Kelpie. His son remained intact and went to another herd where I hope he’ll do great things.